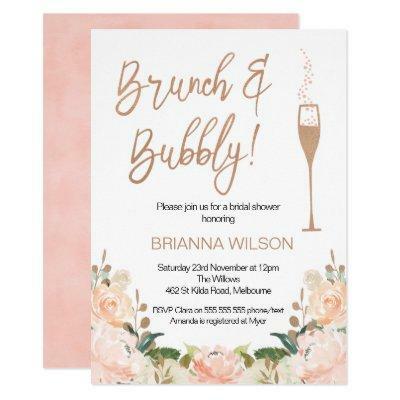 This bridal shower brunch and bubbly invitation features a faux rose gold heading and a tall elegant champagne glass also partly in faux rose gold foil texture. I&#;ve added a floral arrangement at the base of the design with some faux rose gold leaves. The back of the invitation features a almost peach watercolor image that matches with the floral arrangement on the front. More invitation designs in this theme are available at the store. This brunch and bubbly faux rose gold foil bridal shower invitation is ready to be personalized.